My OUTLANDER Purgatory: Another Outlander Tattoo! Ooooh this is getting fun! 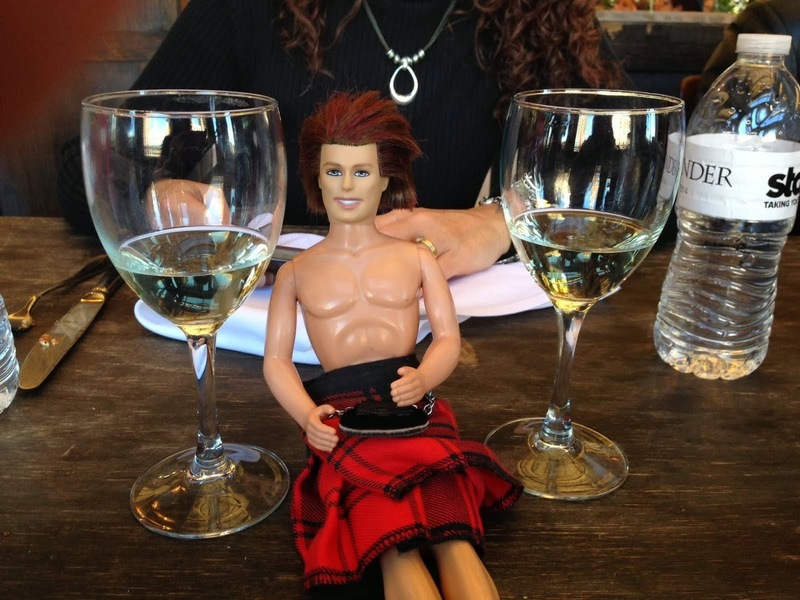 Take a look at My Outlander Purgatory friend Kelly's Outlander tattoo! Isn't it purdy?! LOVE this one! I have Claire's ring with this engraved on the inside, too. So jealous! That is the one I've been wanting to get. I was thinking around my ankle. Very cool!! that is beautiful, it has definately got to go on my tat wish list now i've seen an example. if you don't mind me asking, do you get to show it much and what is the usual reaction when you translate it? @ Lesley - I show it as much as possible lol I love it cause I gave my tattoo guy the words and said that I wanted it pretty and this is what he drew up and I fell in love with it instantly. When I tell them what it means, they love it. Yes i'm thinking ankle as well but would i need a sedative first? -lol -The one on my shoulder was painful enough. All I know is the ribs hurt like hell lol I don't know much about the ankle, but it all depends on your pain tolerance I think. The two on my ribs hurt the most, the one in the middle of my back and wrist didn't hurt at all. Simply beautiful, Kelly! Love it! i love it Kelly!! I wish i could do something on my ribs like that, but two kids destroyed that, lol. That is so the next phrase i want to get, i think im going to do it perpendicular to my wrist, so going down my fore arm, in the same script. I love the script yours is done in though! Its absolutly gorgeous! It's absolutely beautiful !! I can't wait to get home and look up what it means so can someone tell me in the next 6 hours hahaha. That is beautiful, Kelly.....triple ouch! @Megan.....left a note on your blog. Scots Dunedin is lovely! So....MOP sisters C & T, you sporting any Outlander tats? LOL Svon - my kids ruined my chances for ever having a nice mid-section again too...well, without plastic surgery, that is. LOL! I think we should all get Outlander tatoos! @carol, i love the idea of having your kids names in tattoos, i have my oldest son's footprint, and my youngest son's handprint next to each other on my calf, i get compliments all the time. @menatra, i know what you mean, im all nervous until i get in the chair and the machine starts, then im fine, it doesnt feel wonderful, but it is not as bad as you think, depending on where you get them, Kelly is a brav soul, i have heard the ribs are the worst as far as pain factor, but for a tat like that, i would do it too lol. 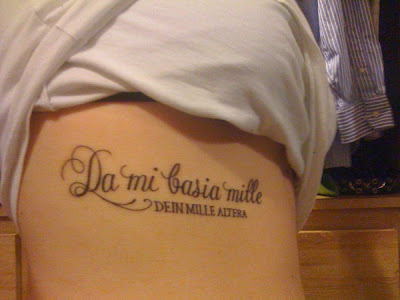 @ Megan - Da Mi Basa Mille means "Give Me A Thousand Kisses" and Dien Mille Altera means "Then Another Thousand" or "Then A Thousane More"
KELLY: Thanks for that :) It's beautiful in design and meaning. @ kelly..of the 10 that i have the wrist was the least painful of them all. You are a brave soul lol. So this site seems to be the only place I can actually find an Outlander tattoo. I am thinking of getting "Je Suis Prest" maybe with a celtic knot around my ankle or "Dinna Fash" with dragon flies around it. What do you think? I love reading, and what better way to recognize it than the best loved fictional characters?